Thyroid cancer occurs when cancerous cells form masses in the tissue of the thyroid, which is located at the base of the throat. The thyroid is an important gland that consists of two lobes on both left and right sides. Thyroid cancer has four major strains which are determined by the formation of the masses and how the cells look when observed through a microscope. These strains are papillary, follicular, medullary and anaplastic. Each strain brings with it its own type of treatment and its own prognosis. In this article, medullary thyroid cancer will be discussed in detail. As one type of thyroid cancers, medullary thyroid cancer (MTC) is caused by a relatively rare strain, which accounts for only about three to ten per cent of all varieties of thyroid cancer known to medical science. While other strains of cancer found in the thyroid come from follicular cells, MTC consists of neuroendocrine cells, which means that the cells function as if they were part of the nervous system. The cancerous cells found in MTC are secreted by the thyroid itself, as they are mutations of specialized cells known as parafollicular cells. Parafollicular cells, also known as C-cells, are special cells which secrete a hormone called calcitonin that is used by the body to regulate bone growth and blood calcium content. Because of their specialization, these cells share commonalities with both nervous system cells and endocrine cells, which make it very distinct from other cancers of the thyroid. 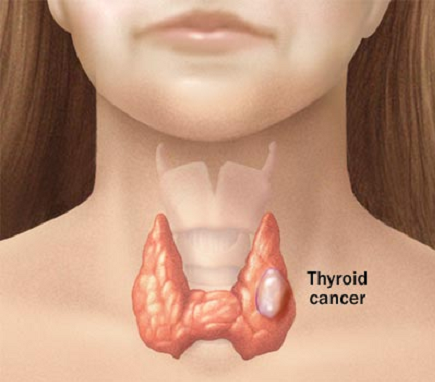 What Are the Symptoms of Medullary Thyroid Cancer? Problematically, many instances of medullary thyroid cancer are asymptomatic, meaning that the sufferer may not know that anything is wrong. The most common signs are nodules in their throat, which can often be very large and visible or felt under the skin. These nodules can also cause significant difficulty when swallowing or even obstructed breathing when the patient is lying on their back. If the cancer spreads into structures surrounding the thyroid, the patient may begin to notice enlarged lymph nodes, a shortness of breath and hoarseness in their voice. These are all very serious symptoms that, if noticed, should be examined by a doctor immediately. Diagnosing medullary thyroid cancer correctly is crucial to ensuring that the patient gets the correct treatment, and an incorrect diagnosis can lead to further complications. Doctors can make use of a variety of different tests in order to ensure that they make a swift, correct diagnosis. Testing the blood for improper levels of calcitonin is a common way of checking the proper function of the thyroid. The differing levels of calcitonin can act as a good marker for the amount of cancer present as well as being used to screen a person for medullary thyroid cancer. CEA is a substance that is secreted by cancerous MTC cells in advanced cases. This can be detected in the blood stream, and can be used as an indicator of recurrence of the cancer as well as a benchmark for the severity of the cancer present in the patient. Ultrasound can be used to create an image of the thyroid and the lymph nodes in order to locate and map the swellings or masses found. While this technology is not advanced enough to differentiate between benign and malignant tumors, it is useful at checking for any signs of tumors spreading as well as generally observing the state of the neck. FNA biopsy is perhaps the most accurate test when it comes to determining the nature of thyroid masses and nodules. By extracting cells from the mass and examining them under a microscope, medical professionals can draw up an incredibly accurate diagnosis, with an accuracy of between 95 and 98% correct. FNA biopsies are often performed in conjunction with ultrasounds in order to ensure accurate placement of the needle. Magnetic resonance imaging, computed tomography and positron emission tomography are some of the most advanced imaging tests in modern medicine, and all of them can be useful in diagnosing medullary thyroid cancer. By compositing an image of the thyroid and surrounding structures, they can give medical professionals a clear idea of the movement and spread of cancers. If a patient is connected with a genetic occurrence of RET proto-oncogene mutation, he or she should undergo genetic examinations in order to catalogue the nature of the mutations. This should be performed on all family members, as it is useful in testing and treatment of potential future cases within the family, as well as any follow-up treatment that is required. Medullary thyroid cancer, like many other cancers, is treatable through a chemotherapy, surgery and radiation treatments. Each of these have their own limitations and strengths. Should the cancer be detected early enough, surgery can be useful in treating it. The surgery consists of removing the cancerous masses from the thyroid, and potentially removing the lymph nodes as well to try and prevent the cancer’s spread. The lymph nodes are removed due to the fact that, in the majority of cases, patients have already contracted lymph node disease and so even if the mass on the thyroid is removed, the cancer will persist. Because of this, the lymph nodes need to be mapped beforehand in order to determine whether or not the lymph nodes need removing. In many cases, a thyroidectomy is required, meaning that the thyroid must be removed entirely. Radiation therapy is common in the treatment of medullary thyroid cancer, particularly in cases in which there is a higher risk of the cancer returning. If the cancer has made its way into the structures surrounding the thyroid, it is often necessary to irradiate the throat in order to vanquish any remaining cancerous cells, thereby avoiding the recurrence or the need for further surgery. Radiation therapy is typically used after surgery is completed in order to ensure maximum effectiveness. Protein kinase inhibitors are used to block any abnormal kinase proteins from developing into further cancerous cells. These damaged or mutated proteins are responsible for the recurrence of medullary thyroid cancer in many cases, and the blocking of them using chemotherapy is often required in order to ensure that the cancer does not return. As with most chemotherapy treatment, these inhibitors have some side effects which can range from nausea and diarrhea to more serious problems such as cardiac abnormalities, hypertension and even episodes of bleeding.